Trading is a way of expression. Being free to chose the way to express yourself is invaluable. You can be a contrarian; you could be a trend-follower; you could be a swing-trader or a scalper. The number of “expressive styles” in trading is probably as high as the number of drawing styles in art. Considering purely the trading styles, the number of different situations in which a trade can occur are limitless. From this screenshot, if I were to ask 10 different traders, they would have probably taken ten different trades. Just think for a moment- which trades (or setups) you would have taken? Would you have taken any, at all? Are there any trades that are not marked and you would have taken them? How many trades would you have taken in total? These questions might seem repetitive or blank, but obviously traders are asking themselves subconsciously questions like that all of the time. Unfortunately, in a lot of cases they are not being honest to themselves and are making costly mistakes. 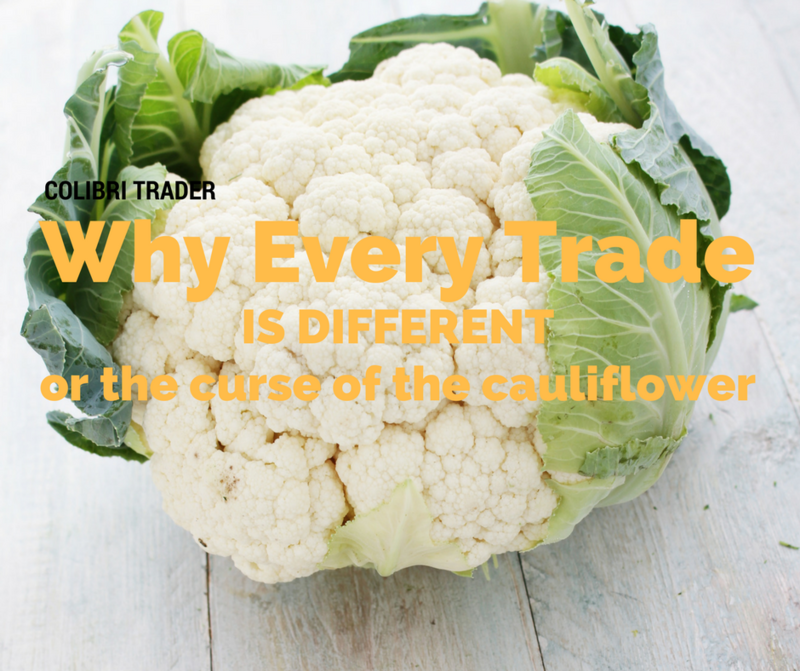 This is what separates good from bad (or inconsistent) traders and leads us to the… “curse of the cauliflower”. As Daniel Dennett describes it in his famous book “Intuition Pumps”, a cauliflower tastes differently at different times. Or as the ancient greek philosopher Heraclitus said it: “You can’t step in the same river twice”, the same way, you can’t take the same trade twice. Coming back to the example from above, it looks like there are so many ways to look at the market and trade a certain setup. Even the same trader could have taken the same trade differently under different circumstances. Imagine you had a gun next to your head- would you have taken this trade a little differently? You could be late at a trade; you could be too early; you could not take the trade at all…you could be all that and more. In the end, what matters is discipline and not so much your predisposition. Why every trade is different? Can’t you use an EA and make sure that you are always executed at the exact place where you want your trade to be executed. Even if so, you cannot be guaranteed that your trade will be executed at the exact place- you could be slipped from your broker or the market environment. You could experience technical problems or software update. Major news release and the list can go on. It is important to differentiate randomness from the trades that are taken at slightly different places. Again- if you don’t have the right mindset and proper rules in place, even a highly successful EA cannot help you. I know traders that after buying perfectly working EAs are modifying them when the first loser appears. This is definitely not where you want end up, because cauliflower might be the only thing you would be able to afford. How can you make sure that you are consistent- a trading system? The only way to be almost certain that your trading will be consistent is to follow a trading system that has proven time and time again that is profitable. In my experience, this might not be too difficult to find. What really takes time is to master a trading system. What takes time is to learn how to stick to your rules and to try to improve day after day. Then and only then you will be “trading in the zone” and will master the trading skill- you will be a grand-trader. Discipline is a very important part of this learning process and if you don’t have a solid foundation- better write down everything and just blindly follow your rules. And remember- never break your own rules. Instead of conclusion- Cauliflowers? What??? As a price action trader, I have been tempted to break my rules many times. On many occasions I have done so and have regretted it afterwards. The “curse of the cauliflower” is any trade- no matter how good or bad it looks taken wrongly. The “curse of the cauliflower” is every time you are saying to yourself “Why did I break my rules”. The curse of the cauliflower is also when you go against your own rules and are trying to change from one trading strategy to another. This trading behaviour won’t lead to a successful trading career no matter how good you are at math. The essence of trading is hidden in the details. No wonder they say that good traders are “one-trick ponies”. The more you stick to what works, the more your chances of winning this marathon are improving. Even if you can’t step in the same river twice, make sure that you always wear your waterproof trading boots. everyday goes by watching bars and indicators to get some grasps of improving my trading. after reading your writing above, I think I should prepare rules of the year and keep on following the rules and not adding rules until another year. if it doesn’t break, I don’t fix it. thanks! Rules are certainly the name of the game. Make sure you have them in front of you at all times.